Campanlaceae - campanula family Dicot. 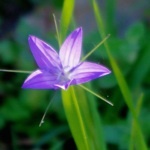 The beautiful delicate Campanula patula is a flower of fields and olive groves; its bell flowers on their tall, slender stems appear among the summer grasses. The petals are translucent violet, the colour halfway between blue and magenta. The conical flowers open with 5 spreading petals, with 5 narrow pointed green sepals between, giving the flowers a star-like appearance. Like many tubular or bell shaped flowers, they have two phases, first the male flower parts, the stamens open, releasing pollen which is transferred to other flowers by bees, which are attracted by sweet nectar, thus ensuring cross pollination. Following a short neutral phase, the female stigma opens to accept pollen carried by bees from from other flowers. In unfavourable conditions, when cross pollination is unsuccessful, the stigmas curl backwards touching the remaining grains of pollen in the base of the flower, resulting in self fertilisation.